Get the inside line on the latest gear, special events, and promotions at Christy Sports. Plus, we'll keep you updated on all things ski and snowboard related across Colorado and Utah! You're signed up and it's already paying off! Check your email for an exciting offer that you can use right away*. Stay tuned for more from Christy Sports all season long! *this offer is for new subscribers only. Never Summer is all about fun slinging and this asymmetrical twin is ready to sling some fun! The asymmetrical Funslinger features a deeper heelside sidecut combined with the Ripsaw Rocker Camber Profile. This board has a soft flex, crazy bite for amazing freestyle performance with a snappier feel. Hextech Topsheet - The PREMIUM TOPSHEETS are our very durable, lightweight, scratch and chip resistant fiber backed thermoplastic. The premium topsheets also provide more grip than other topsheet materials, working as a built in stomp pad. These premium topsheet materials include our Carbonium Topsheet, Hextech, Matte Topsheet and TruGrit Topsheet. Carbon VXR Laminate Technology - CARBON VXR extends carbon fiber V’s out from the inserts to the effective edge for quick response while stiffening the board torsionally. Additionally, V’s are positioned to the ends of the board providing maximum boost and pop when loaded up. This is an ideal layup to transfer energy to the end of the effective edge, tip/tail and still give the board a softer more forgiving mid-flex for torsional control. Extended Transition Area - A small, flat section in the snowboard profile that improves both turn initiation and powder floatation. Vario Power Grip Sidecut - VARIO POWER GRIP SIDECUT utilizes multiple radiuses creating extra contact points to enhance edge hold. A flat section in the rocker area provides a broad contact point when flexed, however when unbent allows the board to track straight and not catch. Flanking this straight section are two shallow radiuses which provide the second and third contact points. Towards the ends of the sidecut are deep radiuses which render quick turn initiation and the final fourth and fifth contact points. The Chairman Power Grip Sidecut has two more radiuses for additional edge hold. Low Profile Nose/Tail - A low profile in the nose and tail of the snowboard maximizes material contact with the snow for more powerful ollie/nollie pop and adds stability to your landings. LOW PROFILE TIP/TAIL also reduces the plowing effect in the nose for better glide to the next feature and superior float when it’s deep. 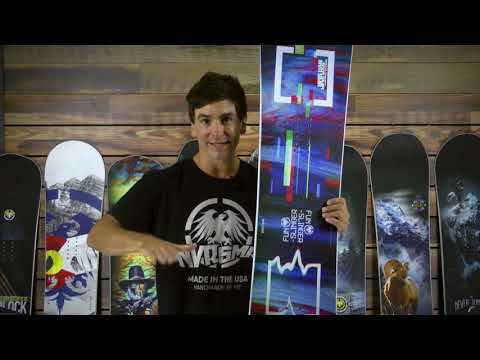 STS Pre-Tensioned Fiberglass - The world’s best snowboard fiberglass, period. Our STS PRE-TENSIONED FIBERGLASS is an advanced pre-hardened, pre-tensioned, layered laminate that has added elastomer stringers between the 0 degree and 90 degree glass fibers (the length of the effective edge). This produces a stronger bond between the individual glass laminates giving our snowboards unmatched strength, edge hold and performance. Bi-Lite Fiberglass - BI-LITE FIBERGLASS combines many of the strength characteristics of our STS fiberglass with an ultra light glass fiber matrix. This delivers incredible freestyle and freeride performance without sacrificing durability. Press Flex Wood Core - This rocker core design features 2 specific softer flex points between the feet creating better hinge points for ultimate pressing and ollie performance. Making the PRESS FLEX WOOD CORE the perfect foundation for freeestyle performance. FDS Dampening System - Specifically designed for some of our freestyle models, FDS utilizes thinner rubber foil for a lighter, snappier feel while still providing the legendary NS smooth ride. Elastomeric Underfoot Stabilizers - ELASTOMERIC UNDERFOOT STABILIZERS directly below the mounting area provide optimum vibration absorption and increase high-speed stability while reducing foot fatigue. Sintered P-Tex Sidewall - We were the first snowboard company to use and perfect SINTERED P-TEX SIDEWALLS, and we’ve never seen one crack. Unlike conventional ABS sidewalls, that have a tendency to crack in colder temperatures, Sintered P-tex Sidewalls maintain their integrity at any temperature. Durasurf Sintered 4501 Base - Crown Plastics has been the industry leader in sintered materials for over 36 years and has created the DURASURF 4501 sintered base exclusively for Never Summer. This new high-density base is extremely fast and will provide unmatched performance and durability. Harmonic Tip/Tail Damper - HARMONIC DAMPERS in the tip and tail take out a high percentage of residual vibration by quieting the nose and tail. This enhances stability at speed, in variable snow conditions and on board landings without deadening the liveliness and pop of the cambered areas.